The officials of Osun state Police Command today arrested 4 members of a 5-man kidnapping gang after a gunfire that lasted for about 25minutes in Erin Osun area of Irepodun LGA of Osun state. Presenting one of the suspects to newsmen in Osogbo, the Police Public Relations Officer, Mrs Folasade Odoro, said the suspects were arrested while on their way for a kidnapping operation on Tuesday. Odoro said the police had been on the trail of the gang for a while before luck ran out of the hoodlums, as four out of the five members of the group were arrested by the police, while one of them escaped with gunshot wounds. She said the kidnappers had been terrorising the people of the state. 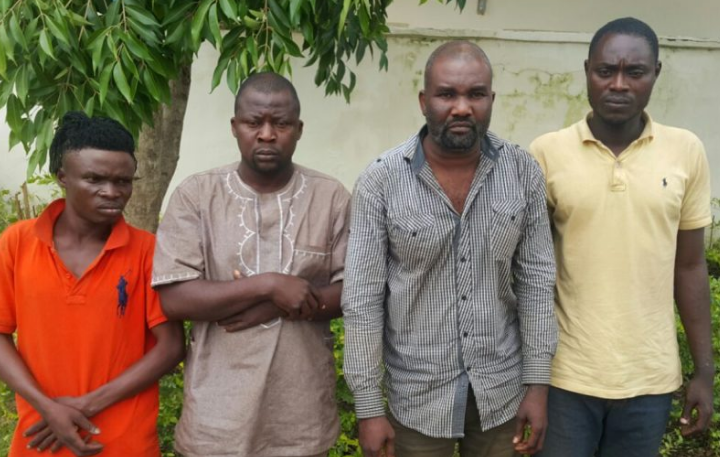 Odoro said the suspects had perpetrated series of kidnapping across the state before they were apprehended, adding that the gang had in its last operation kidnapped a seven-year-old girl and collected a ransom of N250,000 from her parents. “A seven-year-old girl was kidnapped at Dada Estate, Osogbo, when her mother packed her vehicle to buy some items at the market. “They took both mother and daughter hostage but later dropped the mother along the expressway and took the girl away. “The kidnappers later contacted the parents of the girl and requested for N250, 000 as ransom, which the victim parents paid before their daughter was released. “Meanwhile, we did not stop our investigation nor rest on our oars, as our investigation led to their arrest this morning. “In the course of our investigation, it was further revealed that the suspects had also kidnapped a seven-year-old boy from Ogbomoso, a development that led to the collection of N3 million from the parents of the victim. “But unfortunately for them this morning, our men stumbled on them and arrested them while they were going for another operation. “Though there was an exchange of gunfire between them and our men, the development led to three of the suspects and they sustained wounds. “As I am talking to you now, three of the suspects who sustained gunshot injury are receiving treatment in the hospital,’’ the police spokesman said. She said the suspects would be charged to court after the conclusion of investigation and that the police was also on the trail of the fifth member of the gang who escaped with a gunshot wounds. really ugly face like hellfire and balck like night darkness.kidnapping must put to death, this trade will wipe out in naija. really ugly face like hellfire and black like night darkness.kidnapping must put to death, this trade will wipe out in naija.